Where Does All of My Money Go? The first step in developing a budget is tracking your spending. But then what? We then need to accept where our money was going and reroute it to where we know it will make a positive difference. Everyone on the path to Financial Independence tracks their spending one way or another, at least for some period of time. Some adhere to a strict budget and some base their spending strictly on values, limiting wastefulness. Spending should be intentional. We should not only know how we’ve spent our money, we should know where our future dollars will go. 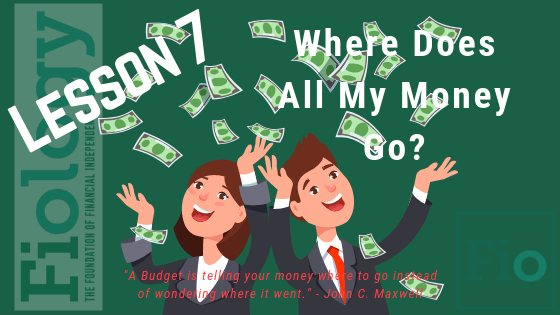 These resources will provide a working knowledge of budgets and some real life practical lessons to make the transition from not using a budget to adhering to one a rewarding experience. Skim: 15 Best Budget Apps for 2018 by Josh Smith of gottabemobile.com. Select one or two (or three) that you think might keep you motivated for a few months of budget familiarity. Take Action: Once a week during your first two months of active budgeting, record your thoughts, feelings, surprises, challenges, etc. with regards to your spending. It won’t all be roses but you will likely find that with time it becomes habit and increasingly empowering. Sending an e-mail to yourself with an easy to recall subject line like “Johnny’s Budget Experiment Week 2” will prove useful in the future as you reflect on your progress towards Financial Independence. Dude! Thanks so much for sharing my article and video. Really means a lot. I love that quote by Maxwell! I find it to be very true. The first I heard it was when I was researching this lesson. It’s a good one. Dave Ramsey has that quote up in his studio, FYI.